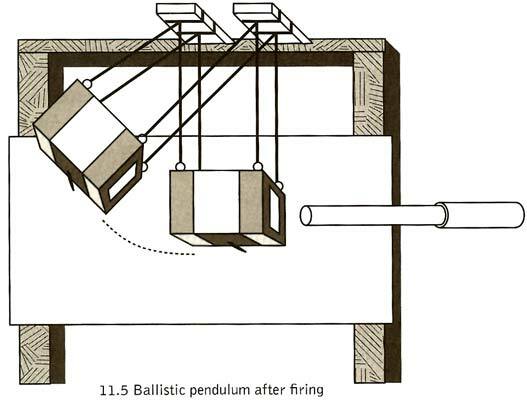 Refer to the ballistic pendulum assembly diagram. Suspend the pendulum from a ledge or ladder as shown. The general idea to keep in mind is that the cannon (or mortar, catapult, etc.) will be shot point-blank into the ballistic pendulum. The pendulum will swing after the projectile collides with it. When the projectile is fired, its momentum is transferred to the pendulum and its velocity can be determined from the height to with the pendulum rises. It is important that the box swings freely after colliding with the projectile. As it swings, the marker will trace out the path of the box on the paper that is attached to the plywood board, marking the pendulum's highest and lowest points. The difference in height between the apex of the swing and the rest position allows us to determine the speed of the projectile. Refer to the assembly diagram and photo. Mount the potator cannon directly in front of the cardboard box so that the projectile will be fired into the middle of the opening of the box and into the wadded-up newspapers. Make sure the pendulum swings in a balanced fashion and that the marker will trace out a clean arc on the paper. Uncap the felt tip marker. Carefully weight the potato projectile on a postal scale, and record the amount to the nearest half-ounce. Fire the cannon into the pendulum. Now, measure the difference in height between the highest point of the arc traced by the felt tip marker on the paper, between the apex and the rest position. See the diagram to understand how to measure the height correctly. With the three parameters now known -- the mass of the projectile, the mass of the pendulum, and the height to which the pendulum rises -- you can accurately calculate the muzzle velocity of the projectile.